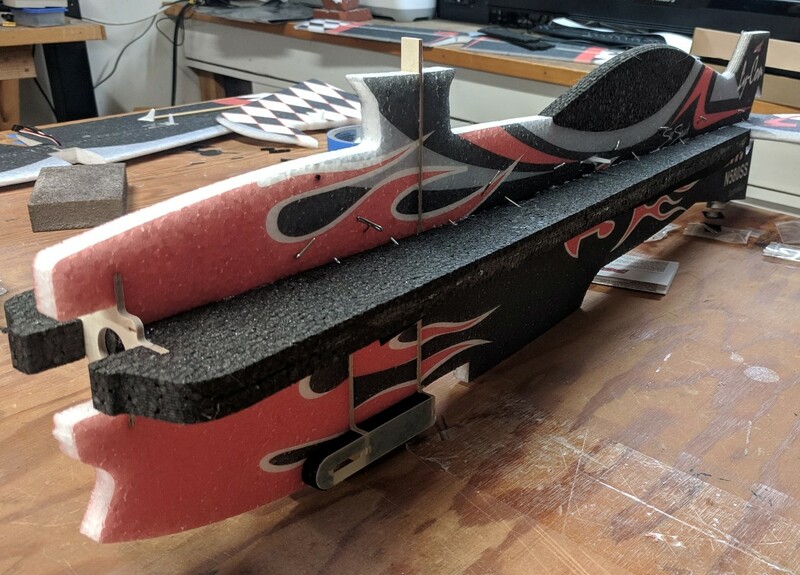 ***Wasn't sure where to put a build thread of a purchased foamy plane so its in here for now. 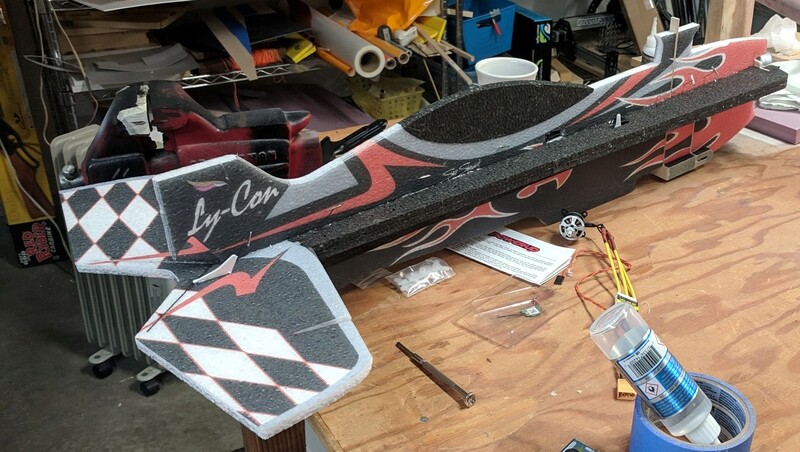 The very first rc plane i ever flew was a 3d brushed motor foamy back around 2012. My friend brought it over one weekend for me to try out. 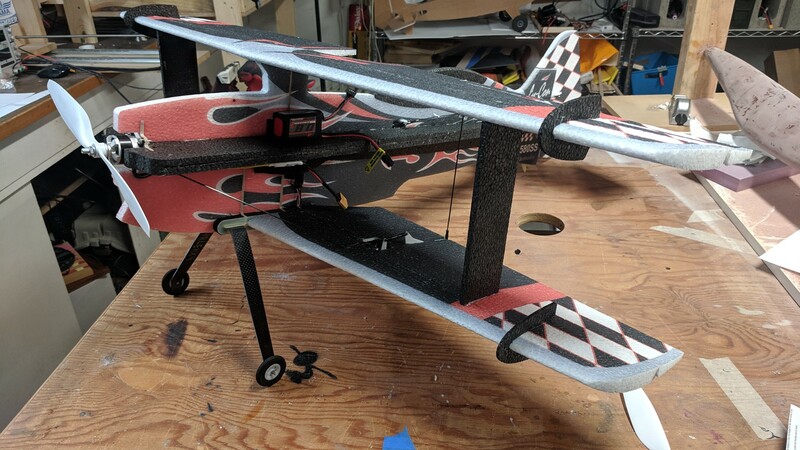 But for some reason i have never built or flown one since. 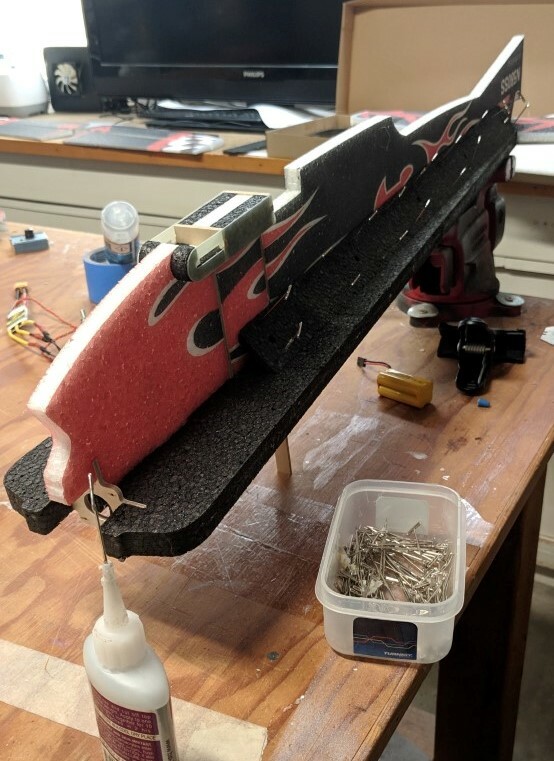 As the nice warmer days have been hitting us here in Northern California i have been wanting to get some stick time in and i realized that a 3d plane would allow me to practice pretty much anything i would want to do on acrobatic slope glider. Practicing rolls, loops, inverted, etc. 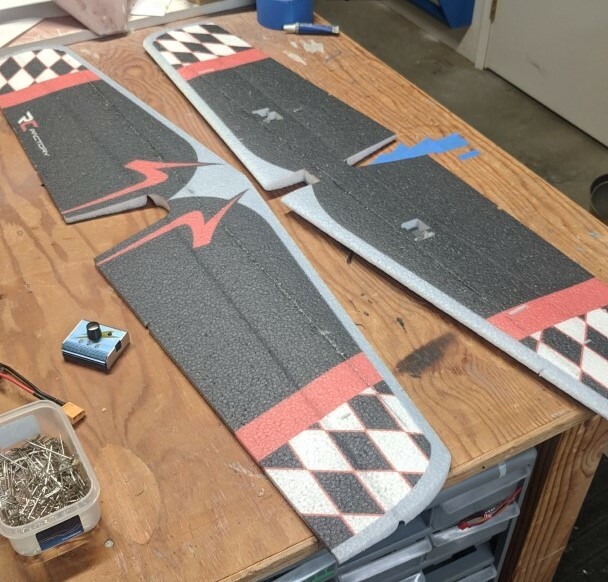 Also they are kind of the quads of the rc plane world as far as letting you fly in smaller areas, so would be a good plane to keep in my car this summer to fly at lunches. 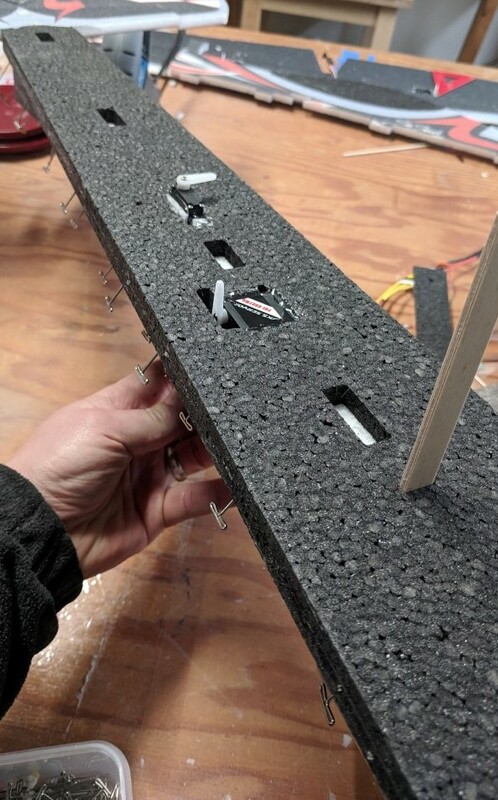 Now usually on epp builds i like to use hot glue for speed of construction but as i want this to be a kit i could store in a hot car i decided to use something else. 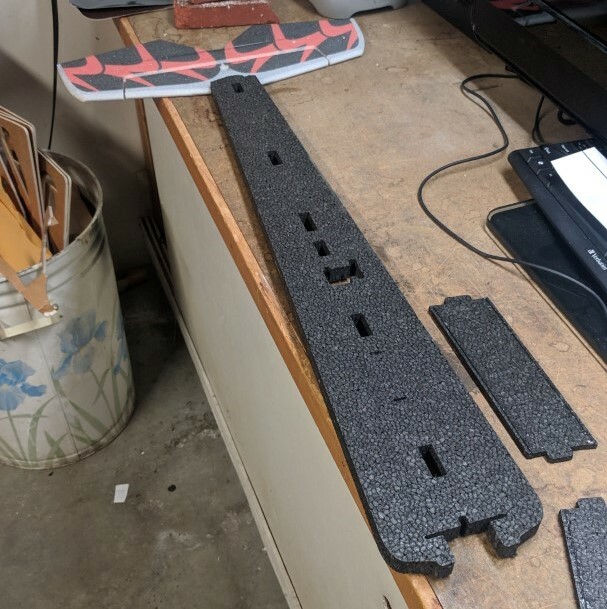 I was going to use Foam-tac as the shipping from twistedhobbies was pretty great, but as soon as i added anything else to the cart it went up drastically. 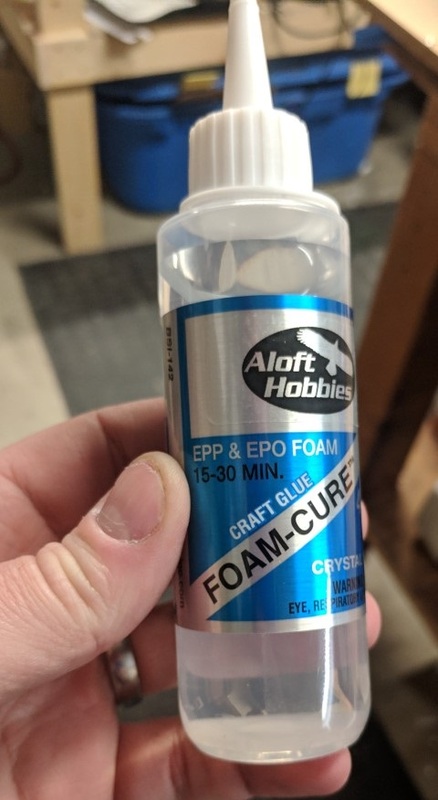 I couldn't find foam tac in stock at my usual places (amain / alofthobbies) but aloft did carry foam-cure which is a epp/epo specific glue and i was going to get my motor and esc from them anyways. Actually after using it you could have put a foam-tac label on the bottle and i would not have know the difference. Pretty great stuff. 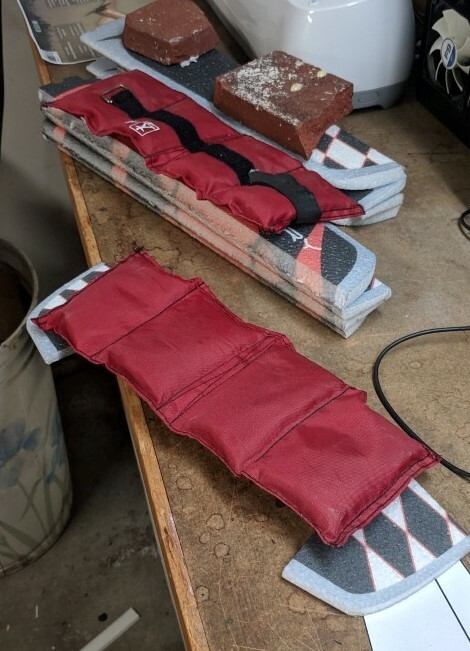 You can let the glue dry for 10 minutes and stick it together contact cement style and you can just pin the parts together wet and it dries together. 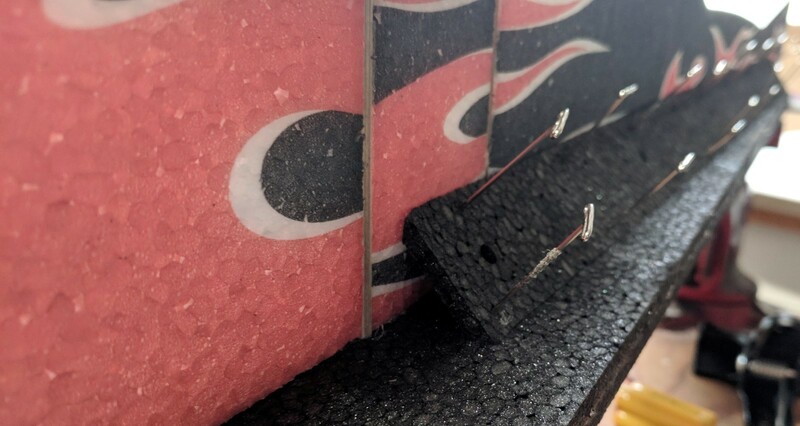 It likes sticking epp to wood and carbon and whatever the plastic is they use for the control horns. Pretty happy with it. Oh and it peels off your fingers really easily. For electronics i went thru Alofts motors and found a comparable motor. 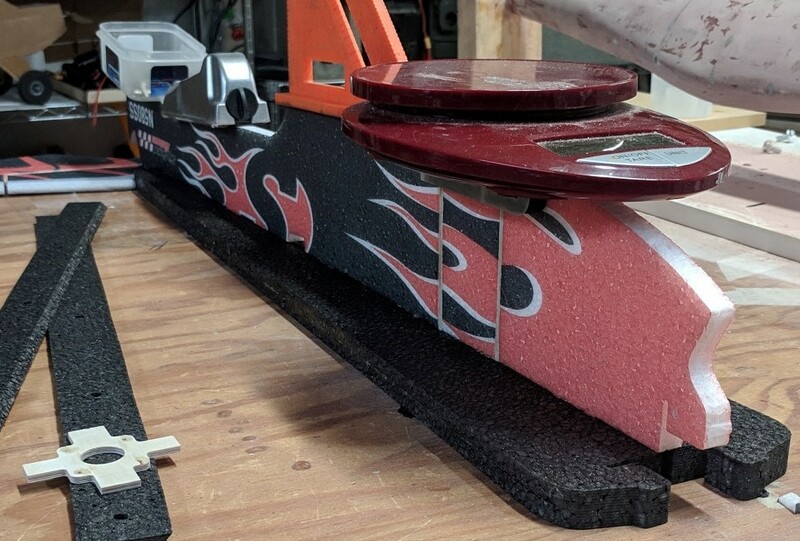 Very similar weight, wattage, rpm, and thrust. 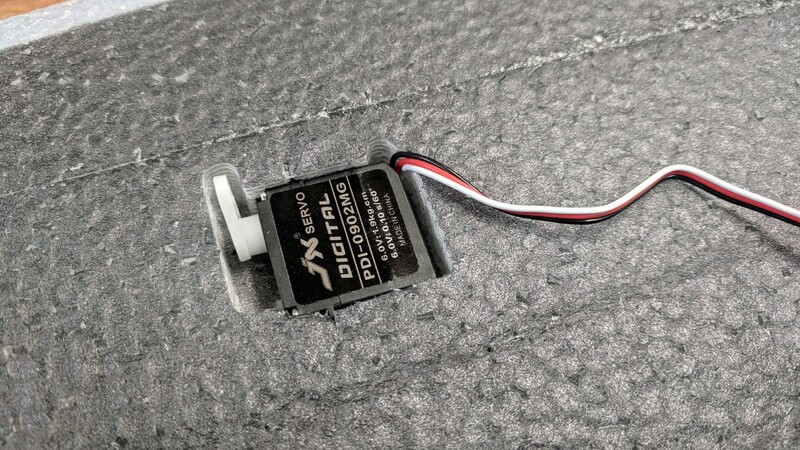 I could have gotten away with a 20a esc, but it was like $2 more to get a 30 and the weight really wasnt that much different. 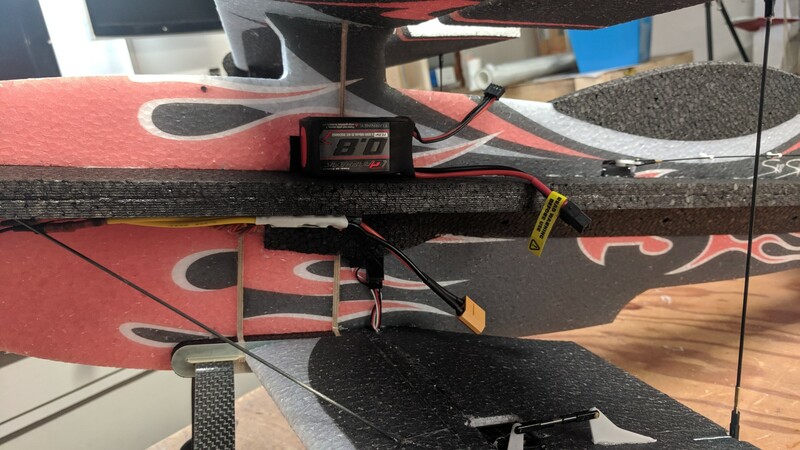 One cool thing about these powerup esc's is you can change the motor direction very easily whenever the plane turns on my spinning the prop in the desired direction. 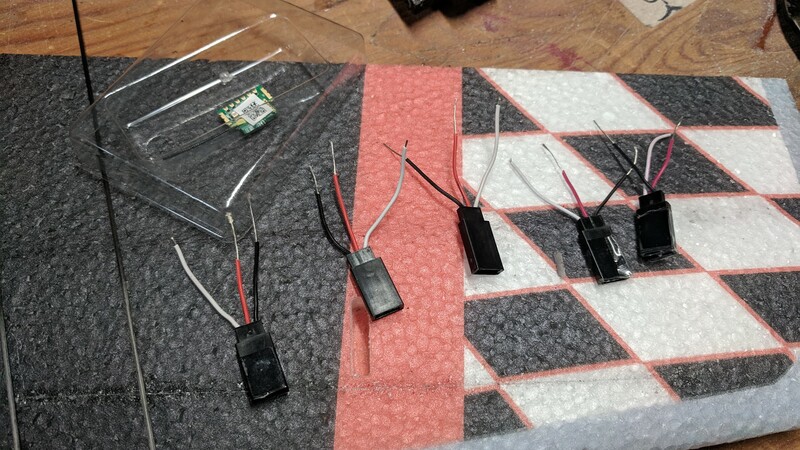 For a battery i am going to use some 800mah 3s packs. I estimate 6-7 minutes on a battery. 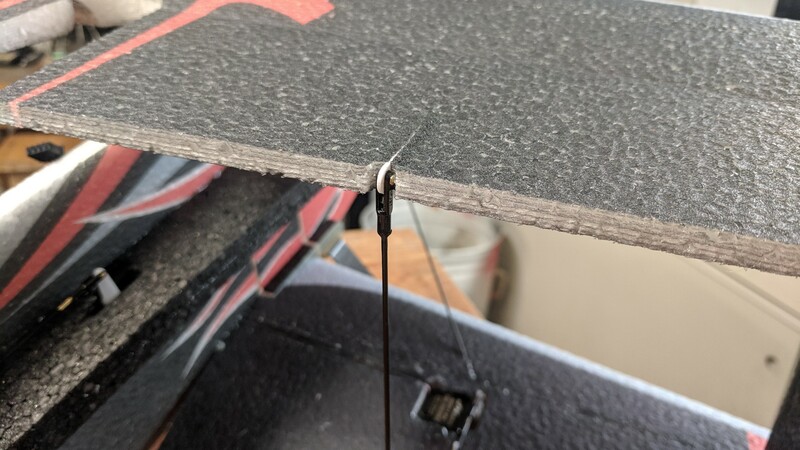 The PDF Build Manual and a nice forum build thread are linked on the twistedhobbies link above. This is more just a review of the process. 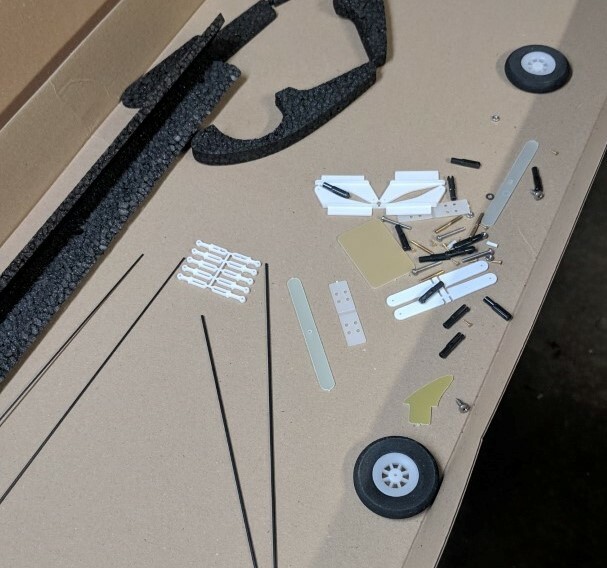 The parts come in a nice box inside the shipped box. 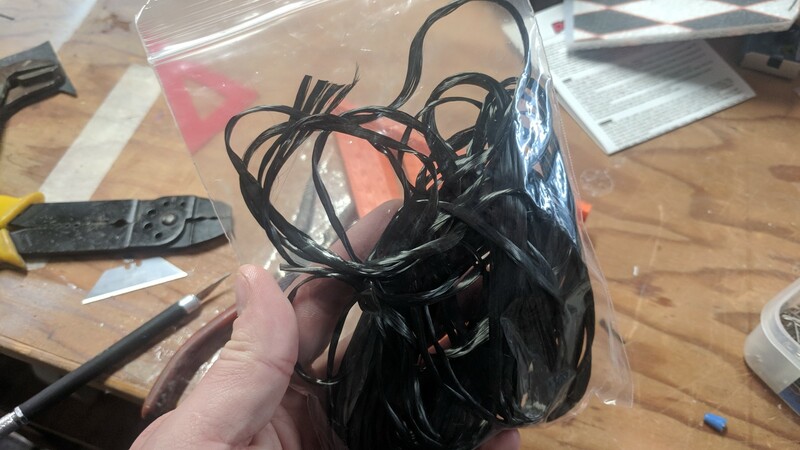 All the hardware parts come in one bag. My one comment on this is that it can be very easy to mix up the parts. Instead of the linkage parts we are used to with foam board kits there are a few more parts. There is the carbon rod. 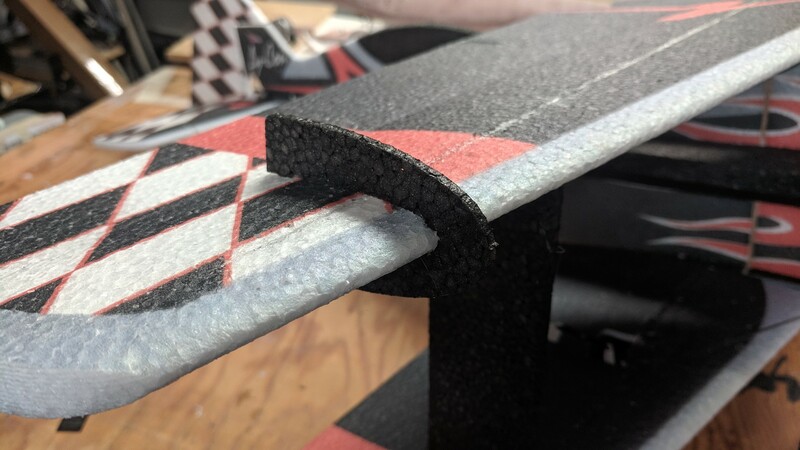 On each end of the carbon rod you have to ca glue a piece of metal. One end of the metal is threaded and one end is a tube. The threaded end is going to screw into a plastic clevis that attaches to your control arms/horns. 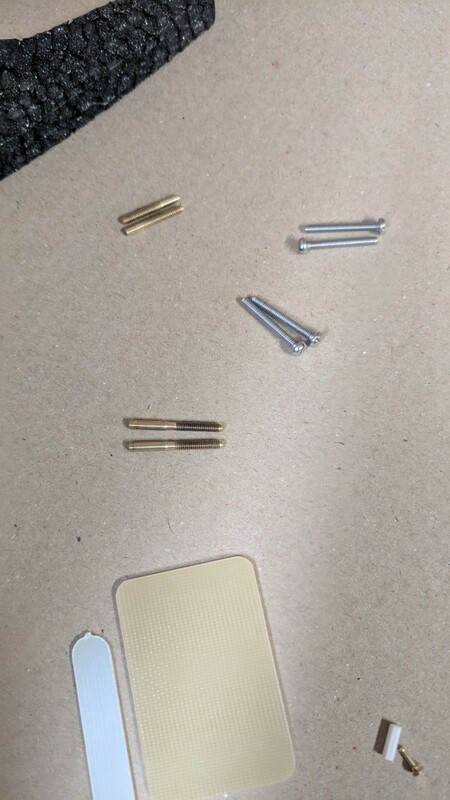 Now the problem is that there are 3 different types and sizes of the metal threaded piece. So if you are not paying attention you could easily use them ahead of time. One of the first steps is to "relax" the epp hinges. These are live hinges using the epp. You need to bend them 180 degrees over on themselves and weigh them down overnight. I had considered doing a hot glue spread in the hinge like our foam board hinges, but i will see how they last first. I can always repair them later. The fuselage is pretty straight forward, as far as its very easy to see and understand where parts go. They key into each other lego style so you cant really install them in the wrong place. But you totally could glue them together in the improper order. There are a few pieces, like the motor mount, that need to be installed before you install other pieces. So i read and reread the instructions a few times to get them in properly. Now they all went in properly except for one part i accidentally flipped around. 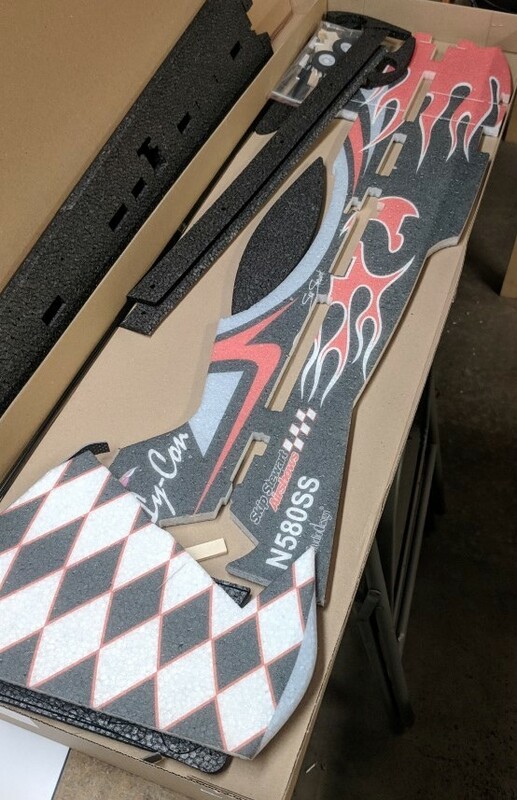 Its a rectangle, so structurally it works, but the graphics on the flames are messed up. Oh well. 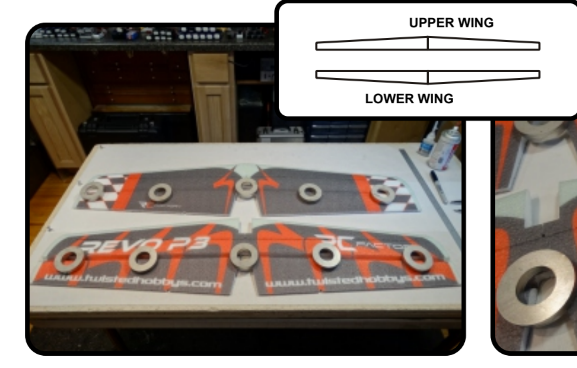 The wings are pretty standard as far as EPP wing reinforcement. There is a spar across the entire length on top and bottom, creating an I beam effect. No matter which way the wing flexes, one of the spars is getting compressed and the other is getting stretched. This creates a very stiff wing. 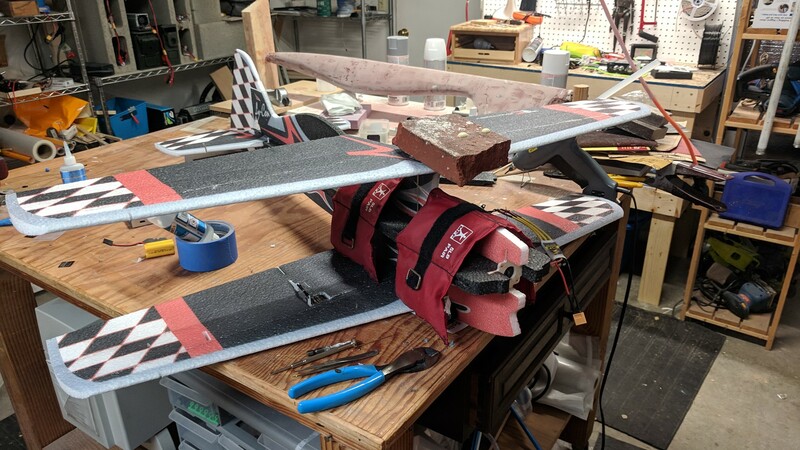 The problem is that if you just assume you know what your doing and again don't read the instructions, you may not realize that as this is a biplane, that will have structs connecting them, that the internal facing side of the wings needs to be glued "flat". 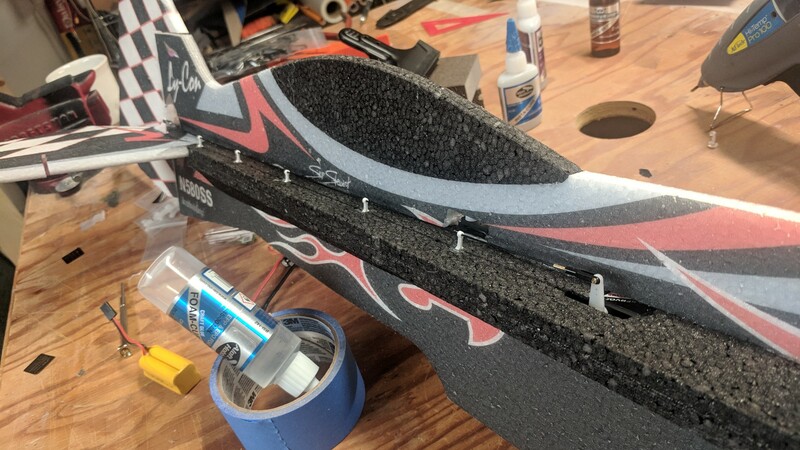 So the top wing needs to be glued with the bottom facing down. But the Bottom wings need the top of the wing facing down, as the spar glue dries. 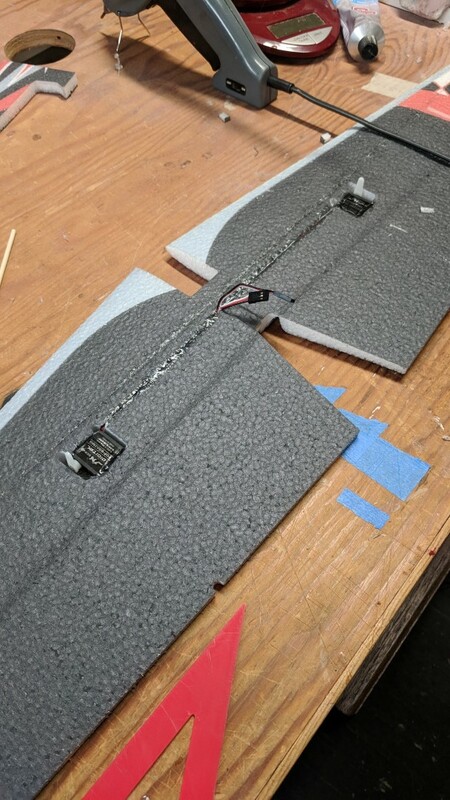 Rudder and Elevator control rods installed. Problem this morning though. On one end of the control rods, for the elevator and rudder, there is a copper pin. 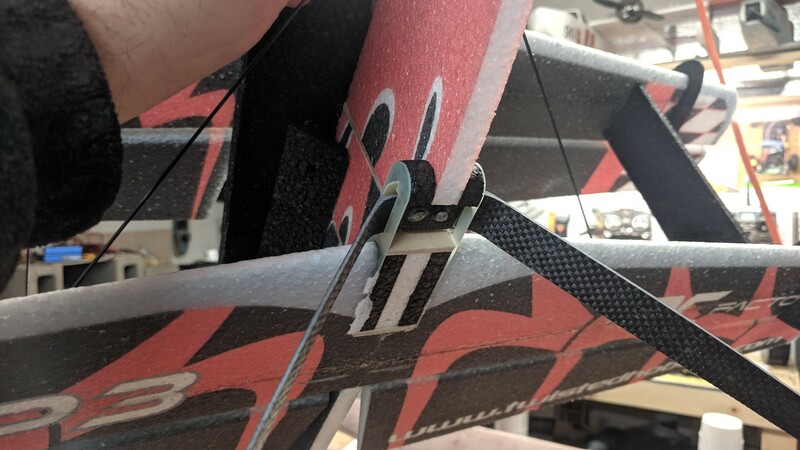 On one side of that pin you insert the carbon fiber control rod and the other end is threaded to thread into the control clevis. You apply thin CA and pinch the copper around the carbon rod. The other end of the carbon rod is a little different. You insert this little piece of white plastic tubing and than push the carbon rod into that and apply CA. White tube in the bottom right of this picture. Its a very tight fit with not much area to get a grip on anything. 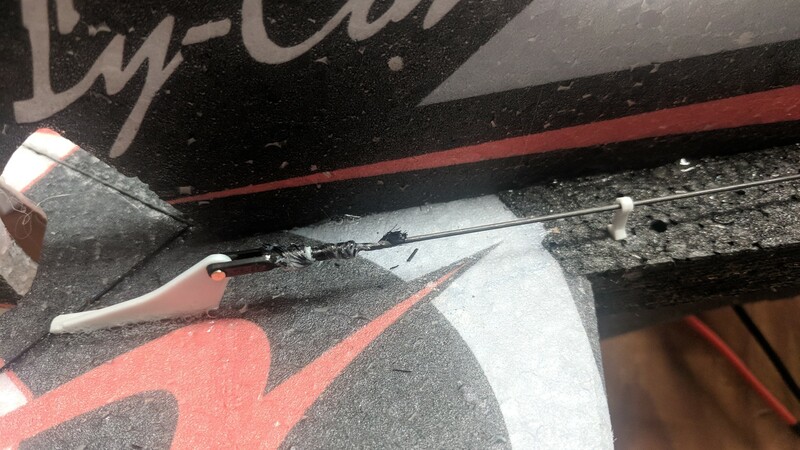 I ended up snapping the carbon rod and didnt have any replacement parts. I grabbed some med ca and welded to the break just to hold it in place. Than i grabbed some carbon Tow, wrapped it around the area and wicked in some thin CA. Seems pretty strong. Guess i will find out later. 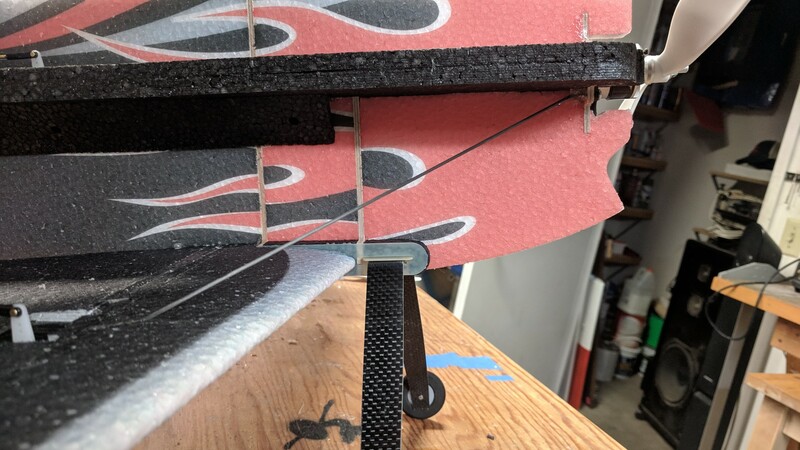 Josh Finley aka Poorman FPV used to post a lot here when he was sponsored by Pulse and flew quads on their team. 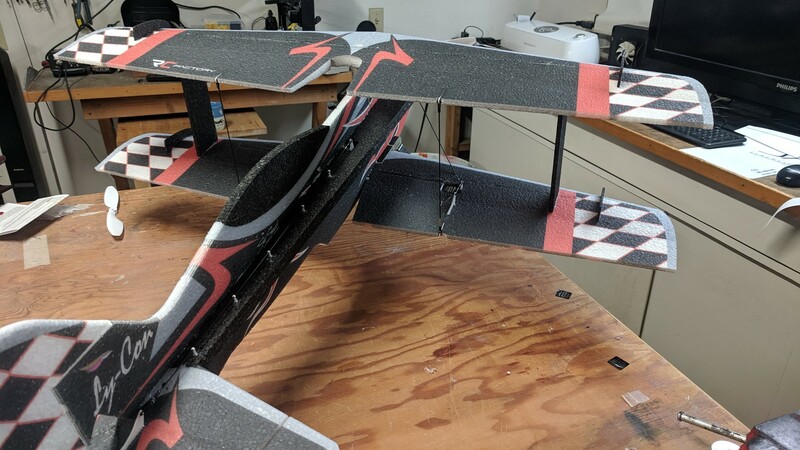 He swapped over to fixed wing and started out on Twisted Hobbies gear. He got good really fast on them. 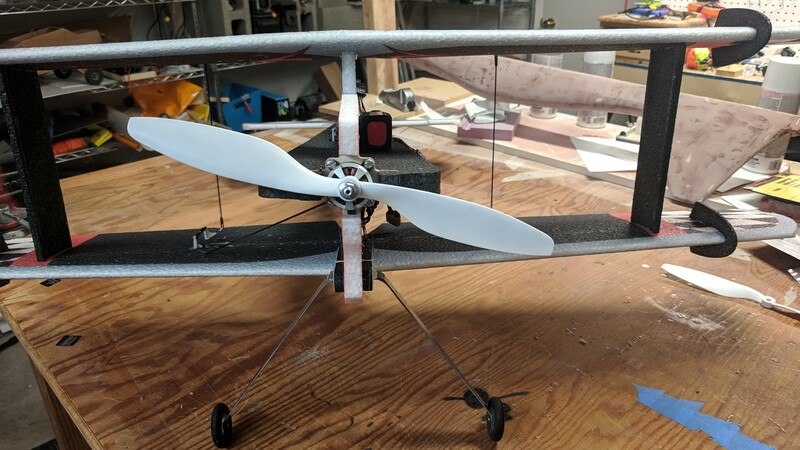 Here is one of his vids on the fokker tri plane to give you some inspiration and confidence in your new toy. Yeah feel free to hit Josh up. He is really cool and loves to talk about what he does. You should see the custom made gasser he tosses around now. Im sure he could pass on some good knowlege to get you goin fast like he did. 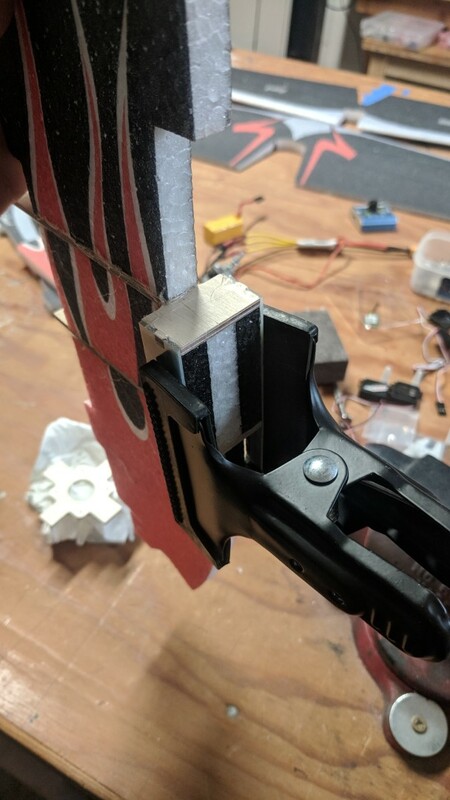 Marked the 90mm cg point and mounted the battery with some velcro. 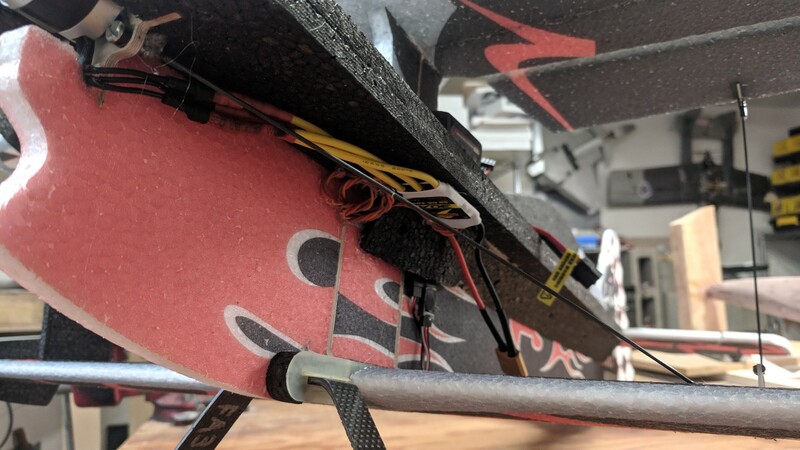 AUW is about 500g with a 800mah 3s lipo. 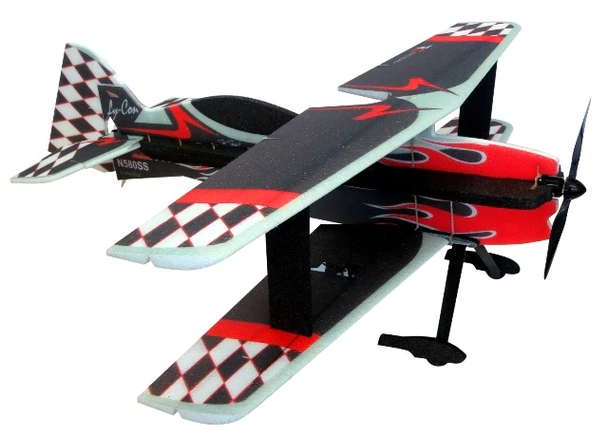 Enjoy your new toy, I have the tri plane and it's a blast to fly. Do you plan on working on your 3d skills? 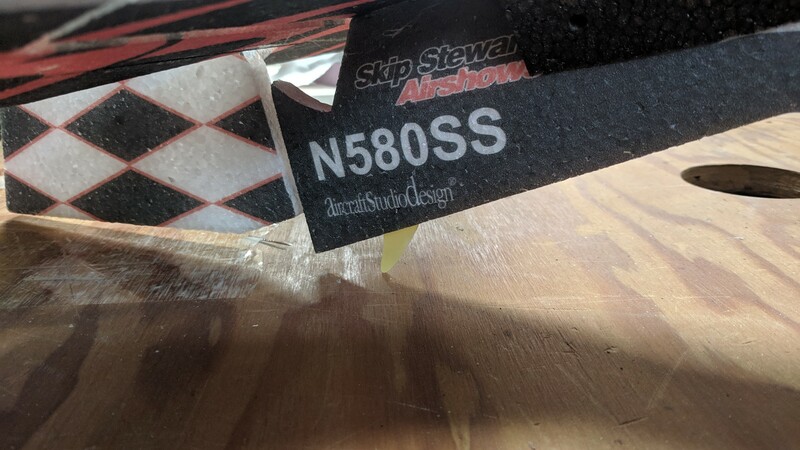 Yes, since i got into slope soaring i have had a lot of interest in acrobatics and practicing my sticks. Been watching a bunch of tutorials lately as well.